NO PROGRAMMING CODES AT ALL! This tutorial is a step-by-step guide for beginners. Sketchware is a great application. Even those without IT or Programming background would be able to follow this tutorial and finally run the app on Android device. It is is SUPER EASY! a. Going to Android App store, search “Sketchware” and install. The app may ask for your option to read the tutorials. App menu is located at top left. If you click the App Menu, you get the menu that includes the Tutorials. So you can select this menu item if you want to read the tutorials in the future. You see a PLUS (+) button at the bottom right of the page. Tap the PLUS button to create a new project. The compulsory part is: Package, Project name, App Name. VIEW section displays the layout of your app. You can put LAYOUTS and WIDGETS into your app. Tap the TextView and drag it to your app page. Then, tap the Button and drag it to your page. Your page has two widgets now. 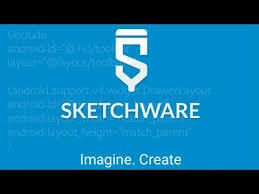 Wait for Sketchware to build the app. Allow Android to install your app. Tap the TextView object on the app page. Change the text to MyTextView. Tap the Button object on the app page. The LOGIC section contains the actions for your app to do. Click the Show Action Panel. Drag the setText action into the app. Assign target widget to the action. When you tap the button the TextView displays "Hello World".